You can also donate if you bank with Chase - use the "quick pay" option (found under payments and transfers) to donate. Did you know is a new way to donate that won't cost you a cent! 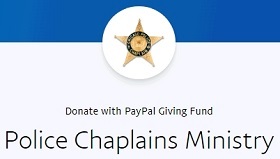 Amazon will now donate .5% of the price of your eligible AmazonSmile purchases when you shop at enter "POLICE CHAPLAINS MINISTRY FUND"
"In lieu of flowers, donations appreciated: Police Chaplains Ministry, 1140 W. Jackson Blvd, Chicago, IL 60607. Police Chaplains Ministry is a 501(c)3 organization proudly serving active and retired CPD members." Thank you for your support of our vital ministry! Police Chaplains Ministry is recognized by the IRS as a 501(c)(3) organization. All donations are deductible to the extent of the law.